Just a few photos of some tattoos that I'm really proud of. 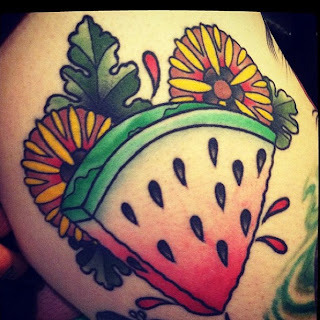 The first being my watermelon done by Thomas Kenney last summer. This is actually a photo that was taken early last week and the tattoo is completely healed, hard to believe this baby is over a year old. If you're unfamiliar with Thomas, you should really head over to his website and check out his work. Many thanks to him for my beautiful tattoos.